In the picture above shows a typical configuration. 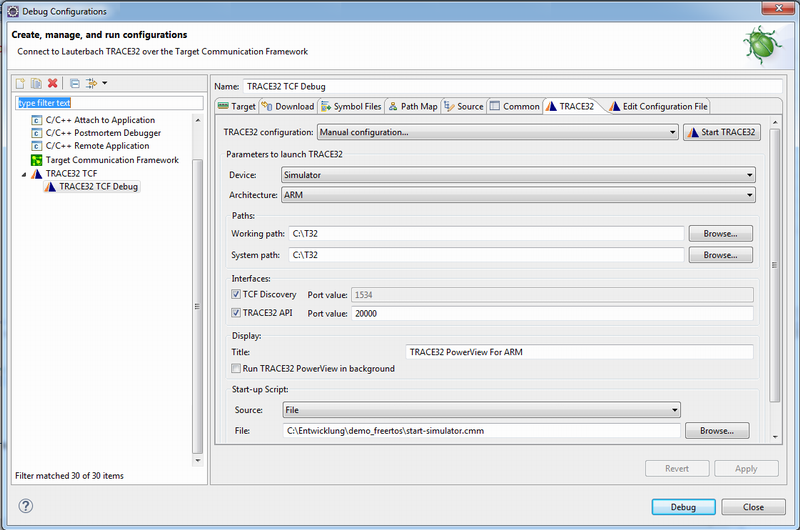 A TRACE32 software, that controls a TRACE32 hardware-based JTAG debugger, is started as TCF agent. This agent ensures that all TCF services requested by the TCF C/C++ Debugger in Eclipse, are translated into JTAG commands and sent to the target. TRACE32 can be autodetected by the TCF discovery mechanism of the TCF C/C++ Debugger in Eclipse, if TRACE32 is started as TCF agent. Lauterbach offers an optional TRACE32 TCF plug-in for customers who want to configure and start TRACE32 from the TCF C/C++ Debugger in Eclipse (see picture below).